Say hello to my new obsession. 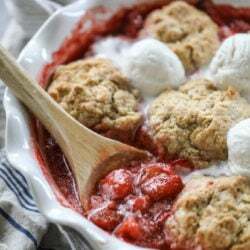 Fresh strawberry cobbler for the win! Just look at those puddles of ice cream swirling into the warm berries with the deeeelish soft vanilla cobbler topping. I cannot even contain myself. I want to eat this every single day. 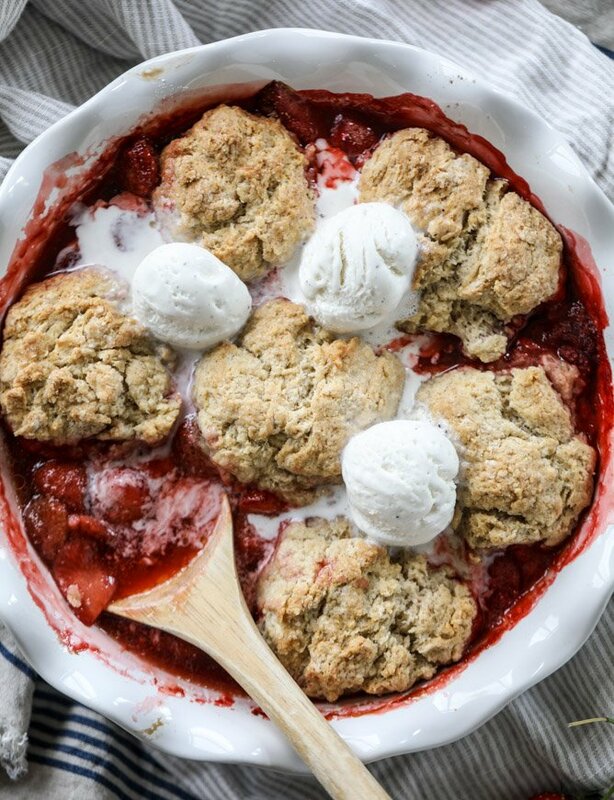 Please send me to fresh strawberry cobblers anonymous ASAP. I am in such a crazy, weird cobbler mode. I want to cobbler all the fruits. If you follow me on instagram, then you saw this over the last two weeks. Me cobbler-ing everything like a freak. I mean, I normally like cobbler, but this summer my intensity is all out of whack. Over memorial day weekend I ended up testing four different cobbler recipes. FOUR. The only saving grace is that people were at our house every single day to eat it. We went through a ridiculously embarrassing amount of ice cream too. 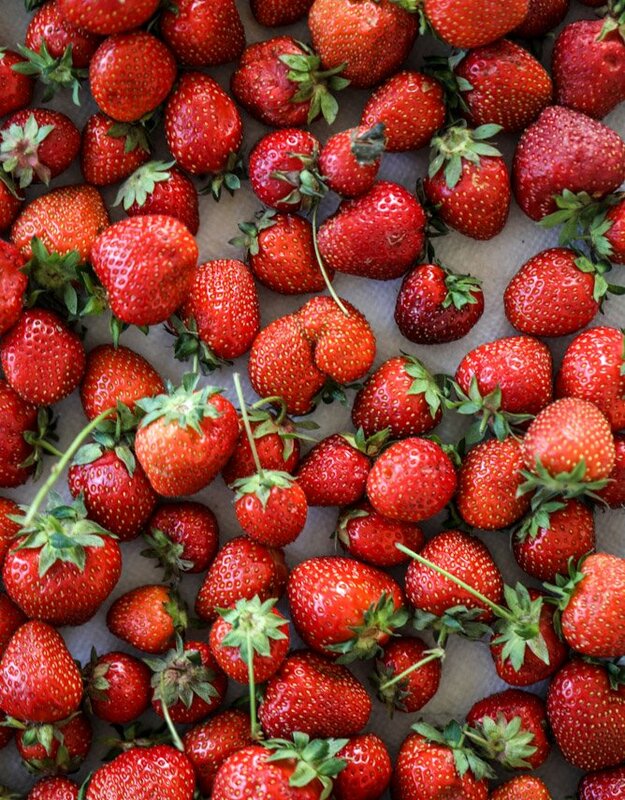 With strawberries pretty much being my favorite fruit, I prefer them most when they are not cooked, not roasted, not in pie. You know? I mean, I make those things too, but biting into a juicy, wonderful strawberry is exactly how I want to start every day. I love fresh strawberries the most and will always choose them first! But! 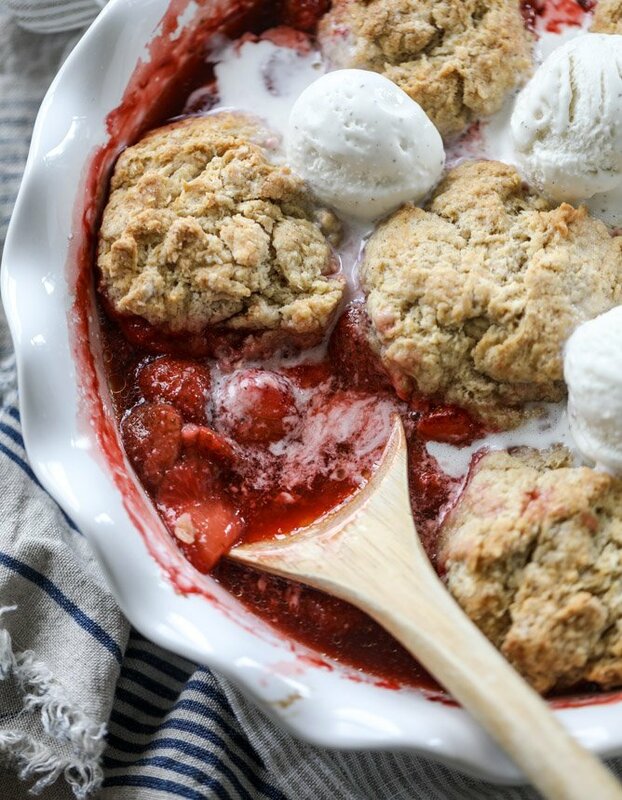 With that being said… this strawberry cobbler is inssaaaane. It is so, so good. On another level, especially if you are a strawberry lover. And especially when served hot and piled high with a hugely humiliating scoop of vanilla ice cream. Or chocolate ice cream! Whatever floats your boat. A few weeks ago, we went strawberry picking for the first time which was so much fun. Well. It was fun for me. Max determined that it made his hands too dirty which left Eddie and I to pick all the berries. Eddie was over it in a few minutes. Which was made even worse when we walked into the store to check out with our berries only to see boxes full of freshly picked berries from that morning that we could just… buy. But I mean, what is the fun in that? I was super into it! And I’m determined to make it a new tradition even with my not-so-sure company. Anyhoo. We were a little overzealous in our picking… probably should have only grabbed one container and not two, but hey. This left a lot of strawberries for desserts! Also, we should note that this cobbler recipe is a bit heavy on the biscuits. The best part, oh yes. Sure, the strawberries are REALLY the best part, but I just want to get a bite of what tastes like delicious vanilla cake with every taste. Not too much to ask. I’m sure. After my cobbler-a-thon on instagram stories, so many of you asked for this recipe. In fact, it might be the most requested recipe that I’ve made before sharing here on the blog! I seriously hope you make it because it is summer in a dish. 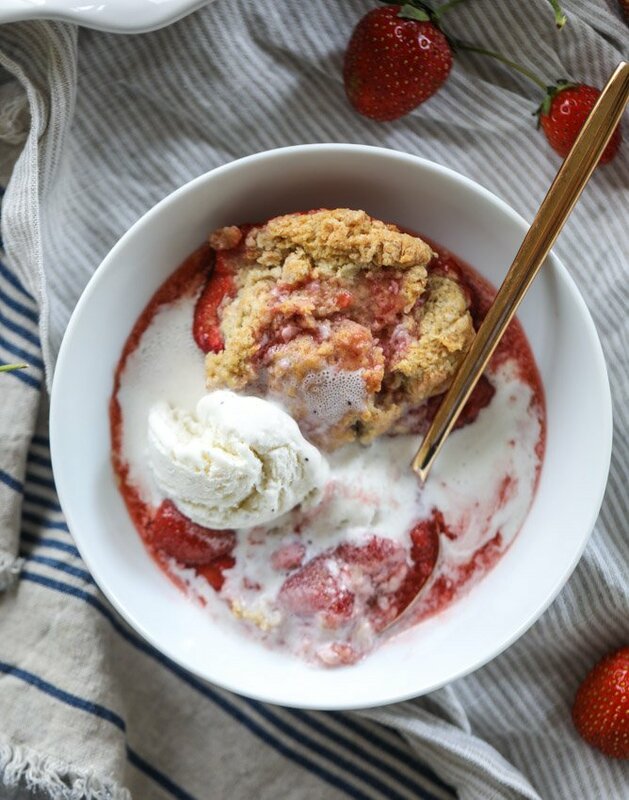 So perfect for fun gatherings but also a great spur-of-the-moment weeknight dessert that you can eat on patio while watching fireflies! Preheat the oven to 350 degrees F. Spray a baking dish (9×13 or 9-inch round works too) with nonstick spray. Add the strawberries and sprinkle with the sugar and cornstarch. Toss gently, just until the berries are coated. To make the cobbler topping, whisk together the flour, sugar, baking powder, cinnamon and salt. Using a fork, pastry blender or your fingers, add the butter and incorporate it into the flour until small pieces and crumbs remain. Beat together the egg, milk and vanilla extract. Add it into the dry ingredients and stir until a dough forms. 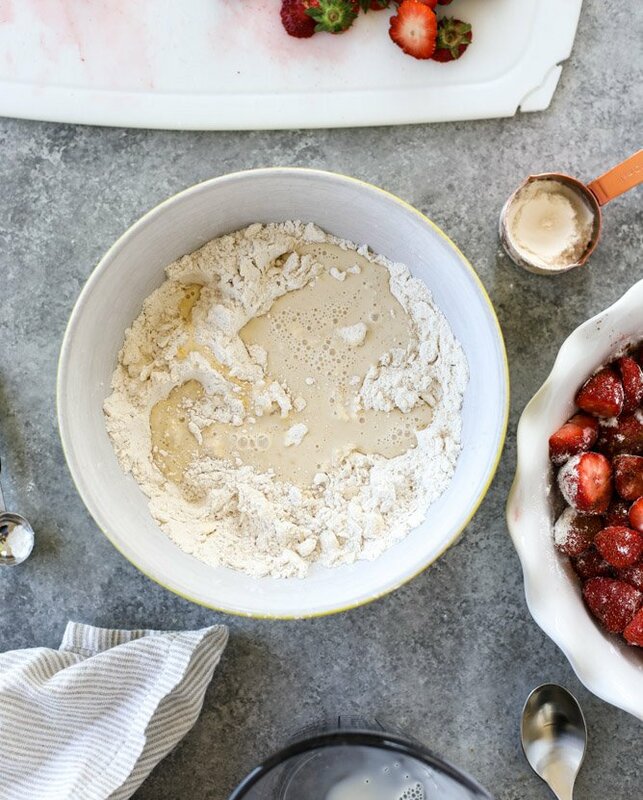 Add spoonfuls of the dough all over the strawberries. Bake the cobbler for 35 to 45 minutes, until it’s golden and cooked through. I sometimes pull it out and check the underside of the cobbler, just to make sure the topping it cooked through. Serve immediately with vanilla ice cream. You can use a little more sugar with the berries if you’d like. My strawberries were SUPER sweet, so I didn’t want to overdo it! If you have so-so strawberries, I’d increase the sugar to 1/2 cup. Yesss I’d like to take a swim in there. life with max: 2.5 years old! Um, yes! This looks insane. I recently went strawberry picking and everyone else was over it because it was drizzling and really buggy but I became strangely obsessive and didn’t want to leave until I’d picked ALL the berries. They’re long gone, so I probably need to go again in order to make this! right?! it is so, so fun! i wish i could grow a huge berry patch in my yard! Thanks for answering my question about whether I could use my frozen strawberries in this recipe! Oh yum! Is there anything better than warm fruit and ice cream in the summer?! this looks absolutely DREAMY! Fresh fruit is the best and I LOOOVVEE summer because all the fruit tastes just so fresh! 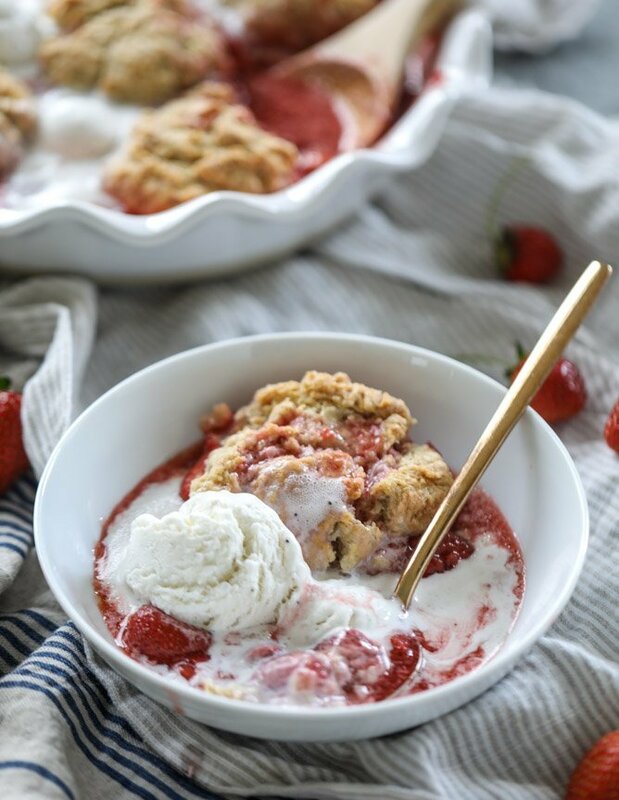 love anything cobbler – ESPECIALLY with vanilla ice cream. Adding berry picking to my summer bucket list! You go right ahead and cobbler all the fruits…I’ll be waiting with my spoon at the ready :D.
Also…never thought to put chocolate ice cream on a cobbler…GENIUS! Love it!!! 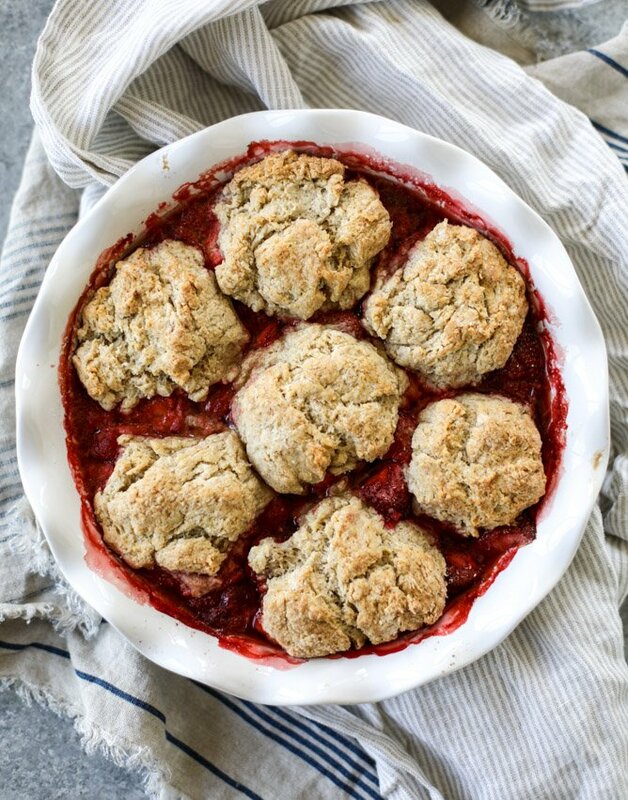 Love love love this – cobblers are the perfect summer dessert. And strawberries!!! Cannot get enough of summer berries right now. They’re just sooo good. strawberry is my fav. i will make this dish at home on this weekends. I love the nostalgia of strawberry picking too much not to go because I grew up picking berries every year, but I totally understand Eddie’s reaction because my husband is the same way. I just go with a friend so he has to miss out on it ;)! There’s just something about fresh off the field strawberries that makes them better. I made a cobbler last year, but I went for a pie this year :D.
leave the boys at home and i’ll come strawberry picking w/ you! normally i’m a ‘chocolate and/or must involve frosting’ type of dessert person, but THIS. looks. SO. good! 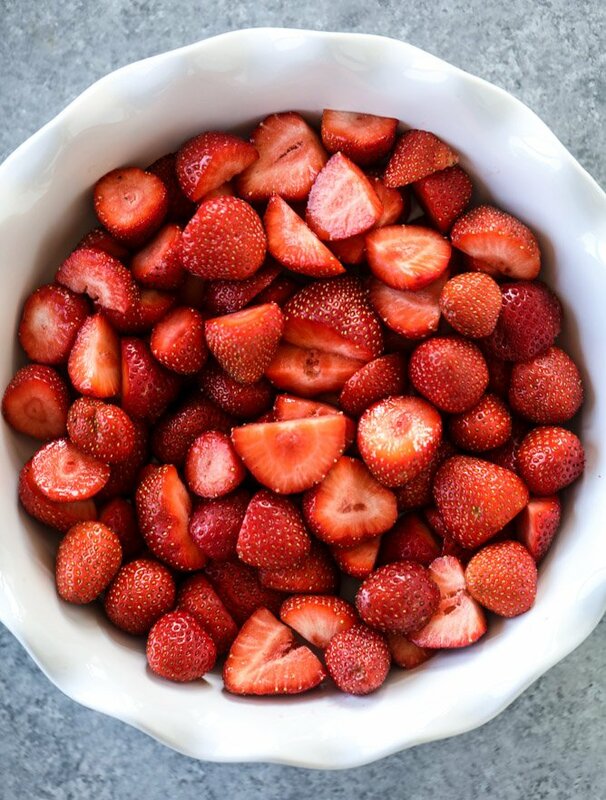 strawberries have always been my favorite…fruit, flavor, everything. actually might make this for myself! i am the same way! i always want the more chocolatey desserts. My mouth is currently watering. Can’t wait to make this over the weekend! Do you think this would be fine with other berries like blueberries??? My dad loves blueberries and this would be perfect for father’s day! I’m with Cobbler is life in the summer and I always go and pick too many blackberries come August but nobody complains when I’m making cobbler all the time. Guess I’ll have to go and get more strawberries to try this though because it looks so good. You just recently said that a cobbler crust is put on top and the crust that rises up around the fruit was called something else, but I can’t remember what. Would you please enlighten me, as me and mom always have said cobbler, and I wanted to tell her the “official” name for it! Thank you! Love your show! Sorry, thought I was asking The Pioneer Woman, but maybe you know answer. Thank you! This truly does look like summer on a plate…er, in a baking dish? But I literally ate 4 lbs of strawberries in a week while I was pregnant with my son and I’ve been obsessed ever since! Will have to make this for a cookout soon! My family (husband, me and 2 little girls) all LOVE fresh strawberries. We have a strawberry patch in our yard and we go pick at a local place. We have gone through like 30 lbs. so far!! I’m always looking for new strawberry recipes. This one sounds amazing!! I think I’m going to try it tonight. So far we have made strawberry ice cream, strawberry lemonade, strawberry vanilla pudding pops, strawberry shortcake, a syrup to make a strawberry cake/cheesecake combo for my birthday next week and strawberry fruit leather!! And we froze a bunch for smoothies over the winter. Sigh, I wish the strawberries were this good all year! I have a blueberry peach version of this in the oven right now! thanks for the recipe! So easy to make, tastes absolutely Delicious! Definately will use this recipe again! Just made this! Can’t wait to try this soon! My boyfriend and I just demolished 2/3 of a pan of this for an afternoon “snack.” It’s delicious! I really love that it isn’t very sweet, but it is sweet enough to be dessert. I eat this food. This food is very nice. wow nice food. I take this food. wow nice food . I eat this food. This is very delicious. Great post and it is very interesting. Really appreciated.